This week the celebrations for Yehudi Menuhin’s centenary reach their climax. The finale of the Yehudi Menuhin Competition comes on 16 April but there are other celebrations too. 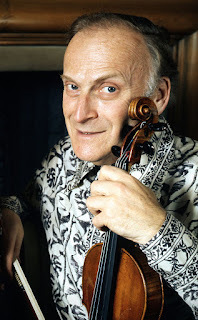 Live Music Now (LMN) was founded by Yehudi Menuhin to support musicians bringing music to those in challenging circumstances, and to provide work for young musicians and the organisation continues to fulfil Menuhin’s aims. LMN will be holding its Menuhin Centenary Conference at Kings Place on Saturday 16 April 2016 bringing together LMN musicians, managers and partners together to discuss Menuhin's legacy. The conference is open to the public and it is hoped people will join in to contribute to a wider body of evidence supporting the professional development of musicians in music outreach work focussing on well-being and special educational needs. And on the Sunday morning there is a coffee concert by LMN musicians past and present, including Anne Denholm, Craig Ogden, Tir Eolas and members of the Sacconi String Quartet.